I am totally going to embarrass my husband by sharing this. He thinks it makes us sound like the weird homeschooling family. I think it's totally cheap and simple! When I discovered coupons, I built up a pretty good stockpile of Tide. That worked well on our diapers, so I stuck with it. Then I began reading about people who made their own detergent. It seemed really cheap and easier than stalking sales and coupons. I decided once the stockpile ran out, I would give it a try, and that time came recently. So far, I have had really great results. It didn't cost much at all for the supplies to get started (around $8.50 with lots of left overs of everything except the bar soap), but I did have to do a little searching. Since it's working out so well, I thought I'd share the recipe I use with you as well as the basics of my wash routine. 1. Grate the bar of soap or cut it into chunks and run through your food processor. I don't have a processor, so I grated. It was pretty easy. This is just one of several soaps you'll see in recipes, and I found it locally at Cracker Barrel because Harris Teeter was all out. 2. Mix everything together and store in an air tight container. See how easy that was? 3. Use 1-2 Tbsp. for smaller loads and 3-4 for larger or really icky loads. I have read that some people use 1 for smaller and 2 for larger, but it just seems to work better for me if I use 3, and I don't know what a small load is around here. We don't have those. I store mine in a plastic Zip-Loc container, but any plastic storage container with a lid would work. You could use a jar with a lid. I found that an old formula scoop holds 1 Tbsp, so that's what I use to measure it out, and I just keep it right in the container. I haven't used fabric softener in a long time because it isn't good for diapers, and I just quit using it on everything else when I ran out. I kept reading about people putting white vinegar in during the rinse cycle. I don't know about you, but I never know when that is because my washer is up stairs in our semi-finished attic space. My washer does have a nifty little softener dispenser, so I figure that must work the same way. I pour about 1/2 cup of vinegar in there when I start the load. I store that in a mason jar because it gives me enough for several loads upstairs, and I can easily use the markings to see how much to pour in. I found that the clothes don't really smell like much of anything with this detergent. 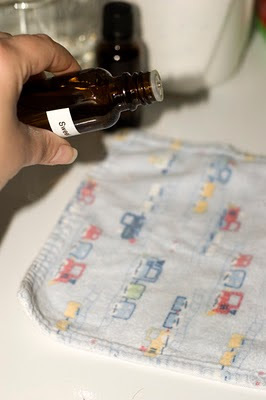 If I feel the need for a scent, then I just use one of our old fabric wipes with several drops of essential oil in the dryer. I throw it right in with everything else, and that gives the laundry a nice scent. I tried sweet orange oil with this load, but it didn't give me very much scent. Lavender definitely works better. 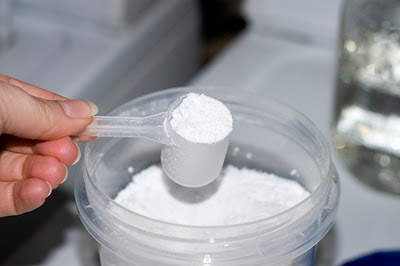 While I was reading about homemade detergent, I came across a bunch of variations on liquid and powder recipes. 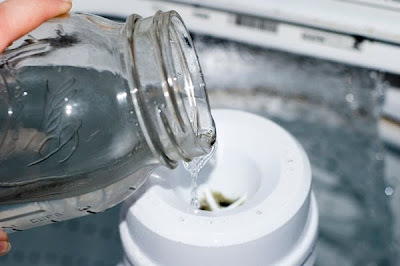 Lauren at Mama's Laundry Talk is hosting a blog party all about homemade detergent recipes today. Head on over and take a peek at some of the other recipes that frugal families use. tell the hubby not to worry. i know several moms who make laundry detergent and none of them are homeschool moms! :) they are just moms who are into frugality and efficiency! I can't figure out why I am so excited about your pics of laundry soap. I love making my own soap. It's a great back up plan when I run out. What?! 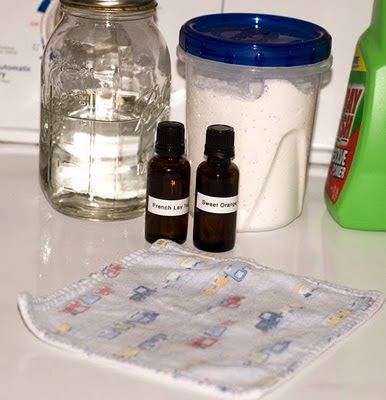 You homeschool, use cloth diapers AND make your own laundry detergent?? Me too :) Well, not the laundry detergent yet, but I'm going to give it a go. Thanks so much for linking your recipe! Love your detergent post- found you on the Mama Laundry Link-up. Love your blog. I am going to follow! Crystal....I make ours too. I got my recipe off the Dugger website. I love your idea about the formula scoop. I'm going to do that.